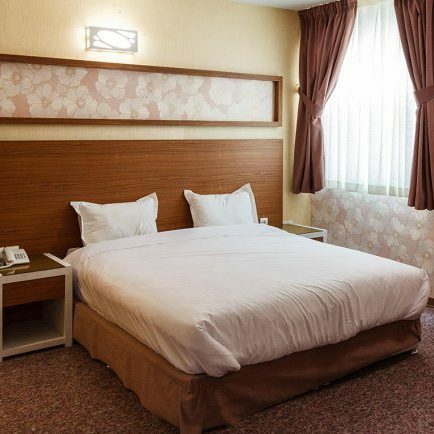 If you visit Isfahan and seek to stay in a newly-built hotel near the city’s famous historical monuments, particularly Naghsh-e Jahan square and Jame mosque, the four-star Avin hotel Isfahan is a good choice with complete facilities. The hotel includes satisfying amenities which fulfill the needs of its guests ranging from different rooms with beautiful design such as single, double, triple, and quadruple rooms to restaurant and café serving various foods and beverages in a relaxing environment. Also, the hotel is privileged to have conference and meeting halls, lobby, tourism pavilion, handicrafts store, massage room and fitness club where guests can have a good time. The advantage for those who stay here is the opportunity for sightseeing and shopping as it is in the vicinity of Naghsh-e Jahan square and grand bazaar where visitors can get acquainted with wonderful architecture and buy valuable Isfahan souvenirs.